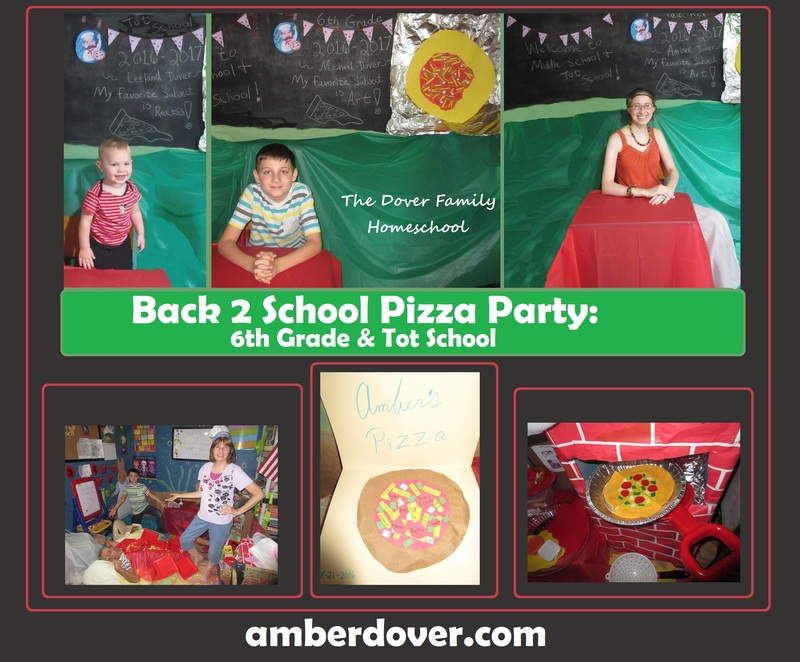 In this post: 2016 Back 2 School pictures, a fun pizza party with crafts and games. Also, our 6th-grade curriculum. Hello, Dear Ones! I hope you are well. Happy Sukkot! We just got back from a fun time camping. Sadly, we haven’t spent much time under our sukkah because of the rain. You can check out previous Sukkots at the above link. So this is the first of three Back to School parties I plan on posting. Michael is now in 8th grade, so this party is actually from a couple of years ago when he was starting Middle School. Still my heart! I can’t believe Michael’s going to 9th grade next year and Leeland to Pre-K! They were so small in these pictures. Leeland was only one and a half! I used the words “Tot School” very loosely. We begin with Michael’s Elementary graduation...I feel weepy! End of the Year Party for 5th Grade- You can find all 5th Grade posts here. 6th Grade Back 2 School Pizza Party- It’s funny because Michael is wearing the same shirt he wore at the end of 5th grade. Lots of time has passed though! You can tell in his face. Awwl…. The Yummy Invite– The point of our Back 2 School parties is to give grandparents and my hubby a taste of the coming year. The kids also get a sneak peek. This was not my original artwork. I just wrote the subjects on the pizza slice. Invite link below. The Set- This was our first Back 2 School Party in the Schoolhouse. I used tinfoil and paper to make a big pizza. I have a pizza banner and a Pizza chef. I found my invites and several printables here. Pizzeria Play Center- I used vegetable calendar pages to decorate the project board wall. Leeland’s Tot Pizza shop had samples of tot school ideas on the wall. We have felt dough and pizza toppings, along with felt (and yarn) pasta. A small shelf became a pizza oven with just tinfoil and brick paper. Michael’s Middle School Pizza Sampler- I made pizza out of paper bags and construction paper. I stapled samples from 6th-grade subjects onto each slice. Here are examples of our two crafts: a personality pizza and pizza topping placemat. I got the idea for personality pizzas here. Basically, the toppings represent elements of one’s personality. I chose to focus on who I am in Christ. I think Michael’s had his hobbies & favorites. Michael with Nana & Grandad. Grandad’s personality pizza definitely had his personality :). Food- Pizza of course! We ordered from Pizza Hut and I made a pizza brownie for dessert (one half topped with fruit and cream cheese). Michael made a Lego Pizza for decoration. Leeland loved his pizzeria. He looked adorable in his chef hat! He was on the move so it was hard to get a clear picture. We watched this video on the history of pizza, while we ate. Human Pizza Game– I love this game! We used a red tablecloth for sauce, yellow confetti for cheese, and red plates for pepperoni. Basically, it is a race to make the best human pizza. One person is the chef and the other the pizza. If you use any of these ideas I’d love to hear about it or get a link in the comments. Now…on to the curriculum. Math– Math U See Zeta: Initially we loved the idea but because we started this in Middle School, we didn’t use the manipulatives much. The videos bored Michael. We ended the year using Horizons Math (what we had before). We’ve had a hard time finding the perfect math. We also used a bit of Khan Academy and Xtra Math. Prayer Journal & Bible Study- I used several Bible printables I found online. I put together prayer journal ideas that went with our Bible Study. We focused on the attributes of God this year and used the Discover God 4 Kids website. There are stories, memory verses, craft/recipe ideas, and family activities. I taught Michael the difference between eisegesis and exegesis and what I call the “Common Sense Method” to reading the Bible (context, culture, & common sense). I also taught him the S.O.A.P. method of reading the Word (Scripture, observation, application, & prayer). History– We started Mystery of History Book 1. It starts at Creation and goes to the Resurrection. I have several history-themed posts planned to show later. My favorites are Egypt, Greece, & Rome. I love how this series shows how God is working through every phase of history…after all, it is HIS-story. We are now on book 3 in 8th grade and plan to finish the series in 9th grade. I can’t praise this curriculum enough. We had a blast with Story of the World in elementary school, but MOH feels like the knowledge of a college course taught in a fun and easy to understand way for kids. I have learned so much myself and Michael has done very well with the course. We’ve been using Pinterest ideas to make this course hands on. There are several good project ideas in the book as well. Reading– I chose our books based on MOH. We read Ben Hur for Rome and Black Ships Before Troy for Greece. We read some Patricia St. John books. We did read a couple of modern books like Hugo Cabret. You can find several of our book ideas here. We watched videos as well. We read several books on Church fathers. Art- As I said before, we used a lot of Pinterest ideas that went with History, but we also did our regular seasonal and holiday crafts. As a fun warm up, we used Once Upon a Doodle. We also used Abeka Art C.
Extras– http://6thgradespelling.com/ , https://www.typing.com/ , and Reasoning with The Fallacy Detective.